This is a strongly built, square-proportioned dog, big-boned but not coarse. It should reflect those attributes that made the standard-sized bull terrier a formidable foe in the fighting ring with its sturdy bone and muscle and strong jaws. Its gait is free and easy. Its skin is tight and its coat is short, flat and harsh. It wears a keen and determined expression on its characteristic clown face. Very much like the larger bull terrier, the mini is comical, lively, playful and mischievous. Despite its smaller size, it is not a lap dog. It is every bit as tough as the larger version and apt to want to prove itself even more. It is a sweet clown, devoted but not fawning. It is stubborn and independent and needs to be trained with a firm yet gentle hand — and a good sense of humor. It likes to play and investigate. It likes to dig, and it needs ample exercise. 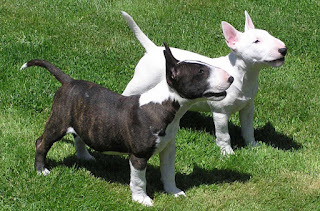 When you look at a Miniature Bull Terrier, you see a strong, muscular dog with a long oval head that resembles an egg (especially in the white variety). Small thin ears point upward, and small dark eyes with a piercing glint are sunken into the head. A short tail, thick at the root and tapering to a fine point, is carried horizontally. The short, smooth coat can be white or colored. The Miniature Bull Terrier breed standard does not specify a weight, but it should be proportionate to the dog’s height. The Miniature Bull Terrier was developed in England in the early 1800s, descending from the English Bulldog and the now-extinct White English Terrier. This cross produced the Bull and Terrier, which was later shortened to the Bull Terrier. Some authors suggest that the Black-and-Tan, the Spanish Pointer and the Dalmatian contributed to the mix. Early Bull Terriers varied widely in size, from tiny toys to much larger dogs resembling the full-sized Bull Terrier of this day. They came in a number of colors, include white-and-black-patched, blue and even pure white. Toy Bull Terriers were shown in Europe until about 1914, but they were not very popular because there was no consistency in type. The toy variety suffered the problems frequently accompanying extreme miniaturization; inbreeding of litter runts led to conformational deformities and dwarfing distortions, together with a number of health disorders. Eventually, the toy variety disappeared. The medium-sized (called “miniature”) Bull Terrier was more typey and thus much more popular, as it more closely approximated the standard “Bully” but was more manageable in size. Breed fanciers concentrated on breeding a compact dog around 16 pounds that otherwise was identical to its larger cousin. 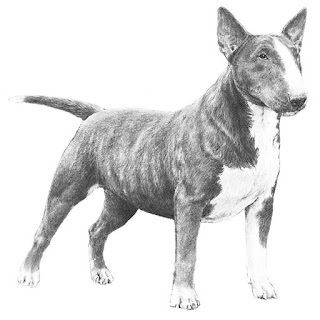 The Miniature Bull Terrier was standardized due largely to the efforts of James Hinks, who bred selectively for white color, gameness and the unusual egg-shaped head. Other coat colors were introduced gradually after breed type was set. Colonel Glyn founded the Miniature Bull Terrier Club in England in 1938. The modern Mini Bull Terrier continues to be a delightful companion and a bold watch dog, thriving in urban environments with city-dwellers. 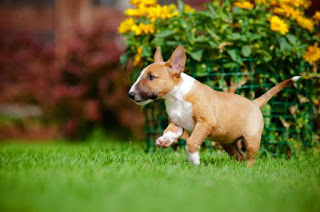 The Miniature Bull Terrier became eligible to show in the American Kennel Club’s Miscellaneous Class in 1963, and was fully accepted into the Terrier Group in 1991. The Miniature Bull Terrier Club of America was formed in 1966 and is the parent club for this breed. 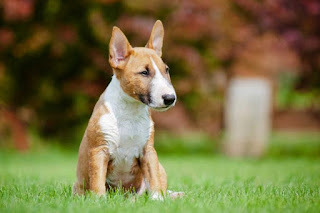 Interbreeding, the process of mating together a Bull Terrier (Miniature) and Bull Terrier, is allowed, only for a short time, in Australia, New Zealand, and the United Kingdom. Interbreeding is undertaken to reduce the incidence of Primary Lens Luxation in the Miniature. The Bull Terrier does not carry the PLL gene so all progeny are phenotypically normal for the disease. The average life span of the Miniature Bull Terrier is 11 to 14 years. Their most serious health issue is a strong breed predisposition to blindness caused by lens dislocation, which typically shows up at or after 3 years of age. Other breed health concerns may include allergies, congenital deafness (in whites), compulsive tail chasing, entropion, mitral valve dysplasia and subaortic stenosis. A minor breed “weakness” is its tendency to fall asleep on its owner’s lap and snore loudly. Bullies, like their larger cousins, are intelligent and have a mind of their own. Training should be started early and always done in calm-assertive manner, as they won't respond to discipline or harsh tones. 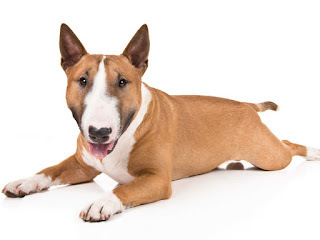 Training is best done in short sessions due to Bull Terriers' short attention span and they will quickly become uninterested, even if treats are used as a reward. Lots of patience is necessary when working with a Bull Terrier, as training can be a long process. Even after your Miniature Bull Terrier is fully trained, they may decide to test their boundaries as they get older. These situations should be handled with calm assertion; like a teenager, they just want to see how much they can get away with. Families with children should socialize puppies early on to accept outside children as welcome guests. While Miniature Bull Terriers will bond nicely with kids in their own family, they can sometimes be aggressive to to other children and should be taught early on that all kids are to be welcomed with open arms. Bullies need a lot of vigorous exercise, but are small enough for apartment life when a commitment is made to their need for physical activity. Though small, they are a hardy breed and are happiest when they are active. Long walks, short runs, or playing long games of ball in the back yard will meet their daily activity requirements. If a Miniature Bull Terrier is not getting enough exercise, they are sure to let you know. They are notoriously destructive, making easy work of flower beds or expensive furniture, and some develop the neurotic behavior of obsessively chasing their own tail. Grooming the Miniature Bull Terrier is a cinch. Though the breed is naturally clean with little doggie odor, a bath every three months (or when he’s dirty) in a mild shampoo for dogs is a good idea. Brush his sleek coat with a natural bristle brush or rubber hound mitt once a week. Use coat conditioner/polish to brighten the sheen. The rest is basic care. Trim the nails as needed, and brush the teeth frequently with a vet-approved pet toothpaste for good overall health and fresh breath. Check the ears weekly for dirt, redness or a bad odor that can indicate an infection. If the ears look dirty, wipe them out with a cotton ball dampened with a gentle, pH-balanced ear cleaner recommended by your veterinarian. Introduce grooming to the Bull Terrier when he is very young so he learns to accept the handling and fuss patiently. They can get along with other dogs their size or bigger, but toy dogs and cats are likely to set off their prey drive. They will chase and kill them if given the chance. Confine him to your yard with a solid fence. An underground electronic fence will not deter the Mini Bull Terrier if he sees something he wants to chase. Good with Kids: This is a suitable dog breed for kids. It is also friendly toward other pets and shy toward strangers. Is the Miniature Bull Terrier the Right Breed for you? 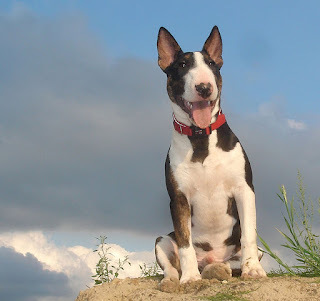 Easy Training: The Miniature Bull Terrier is known to listen to commands and obey its owner. Expect fewer repetitions when training this breed.